I had a massive hamburger for lunch today at the SeaFront, while out in Stanley. I'd planned on going for some good ole fish n' chips at the restaurant (they do them perfectly), but had a change of heart at the last minute. I'm glad I did, too, because the hamburger was juicy and perfect! As I was taking a break from my diet today, I added in a bit of frozen yogurt at the end of the meal to, which meant that I was stuffed up too my neck by the time dinner time rolled around. Thinking about a light last minute dinner, I remembered that I had some soaked and cooked chickpeas leftover from making Punjabi Chole yesterday. The Chole weren't all that successful, but the chickpeas were cooked to a perfect point where they still had a crunch while being soft enough to eat; they were perfect, I thought, for a salad. So! Thank's to the awesomeness that is my 3G network, I looked up Jaime Oliver's Summer Chickpea Salad recipe while at the supermarket and decided to go with it. Unfortunately, they were out of mint, but the salad turned out to be perfect even without it. I ended up eating it with Baba Ghanoush (Lebanese Eggplant Dip), a bit of lavash bread, and best of all (surprisingly) with some roasted papadum! It was a random decision, but tasted like Masala Papad, only tonnes better. All in all, I'm much satisfied and not at all guilty about binging this afternoon after having such a light dinner. Combine the onion, chilies and tomatoes in a bowl. Squeeze the juice of a lemon on top, and add olive oil. Add salt and pepper to taste and mix well. Heat the chickpeas briefly in a microwave just to warm them up a little. 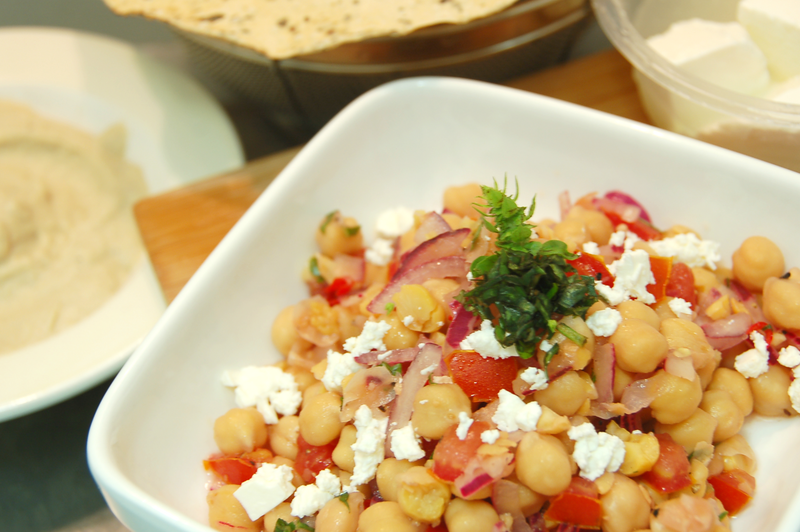 Add 90-percent of the chickpeas to the bowl with the vegetables. Mash the leftover 10-percent and add them to the bowl. These add a much welcome creaminess to the salad. Mix well and set aside for 20 minutes to marinade. Before serving, check to make sure seasoning is according to taste. Add basil leaves and mix through. Crumble feta on top, and you're done!